The usd to cad currency pair was yet another beneficiary of the current round of “dollar bashing” which was seen across the entire market yesterday. 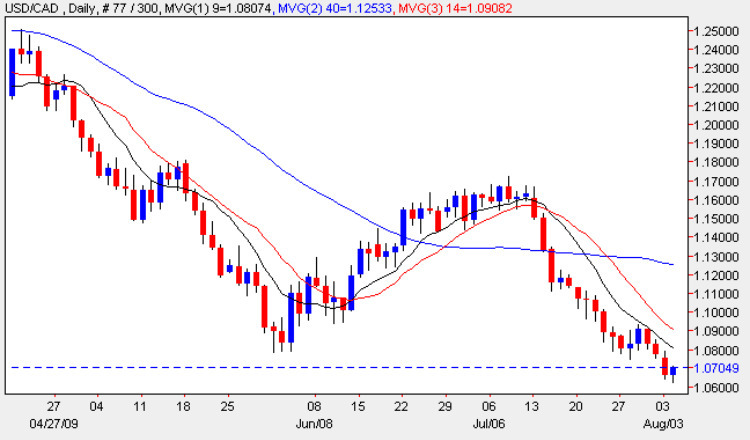 The commdollar pair finished the trading session on a wide spread down bar, having broken below the interim support level at 1.08, signalling that we are now in a strong bear move which should see the 1.05 price handle hove into view in the short term with longer term parity not far away. With the Dollar Index chart looking particularly fragile it will take a considerable degree of momentum and a change in sentiment to reverse this present bout of chronic Dollar weakness. My trading suggestion for today is to sell on any short term upticks. With no fundamental news on the economic calendar for Canada today, the main item is the release of pending home sales in the US which are expected to come in at 0.6% against a previous of 0.1% thereby signalling that the recent “green shoots” are translating into firm economic plants.